The media and the power brokers of college football think they are onto something in nurturing a rising tide of friction, envy, and hate in the college football fan eco-system. Hate has long been an underrated tool for anyone looking to make people watch, care, and pick a side in sports: see LeBron's turn from hero to heel with the help of ESPN. It makes sense at face value. A fan passionate about 1 team may only follow 1 team, but make that fan loathe a handful of teams and suddenly that fan has a rooting interest in many more games and teams. I'll use my alma mater, Ohio State, to articulate how well the racket works. Ohio State fans used to only hate Michigan. Other teams, games, and news within the conference were somewhat interesting, but not required. Outside of the conference, most fans would tune out unless it was a major story of national interest. Then came two BCS title game losses and the rise of the SEC's superiority and, boom, 12 14 more schools to hate. But it doesn't stop there. While it was the SEC fans with their chant, a head scratcher for most sports fans who don't cheer the NL West or AFC East when one of their member teams has a breakthrough, the media cracked the code of capitalizing on this regional zeal. The regional tribalism of college football give a blanket of security that loudmouth analysts, voters, writers, bloggers, and radio personalties to throw out any disparaging comment they want knowing that they are likely safe from any accountability. AP writers can vote a team number one even after losing a game. If any team had a good season, it was deemed they would have "3-5 losses in the SEC" although Texas A&M and Missouri seemed to have not imploded as believed. Hypothetical arguments abound in college football that nobody cares about anywhere else – "If so and so played so and so, they'd lose by 2 touchdowns." It's unprovable, but yell it loud enough and people will take your hot take seriously. The net effect was the experience of being a college football fan got shittier because the shared interest of college football was no longer something that brought people together, but something that started arguments and nurtured ill will towards other schools, conferences, and regions. As Ohio State flirted with climbing towards the BCS Championship game, I found myself utterly sick of it. No, not the part you think where lots of folks questioned the quality of team, but actually the rotating target of hate that OSU fans were required to stay up to date on. It was on two fronts. 1- So and so said this or so and so voted us here. We MUST hate them! Some of the time this was some blatant trolling (mostly Mark May and Clay Travis) but often someone was just expressing a valid opinion. 2- Baylor is nipping at our heels so we need to root for them to lose and be exposed as frauds. Oh they lost? Oregon…. eff them. Oh crap…. Stanford ….time to hate them. Auburn now? Yeah screw them too. Ohio State never had to play Baylor. We'll never know who was better nor will we on any of these hypothetical matchups without a real playoff and hence a media member can claim Ohio State is 28 points better than Baylor or Auburn is 21 points better than Stanford or whatever outlier of a comment can provocatively rise above all the noise. Twitter and message boards then do most of the work. Fans go haywire over extreme positive or negative proclamations from a talking head. The media member with the questionable opinion is now watched to see what other bias or pot stirring comments come out. He/she is getting exactly what they want: A lot of attention in an already crowded space with no accountability of ever being proven right or wrong. With all this gum flapping, fans begin to see their sport in black and white. 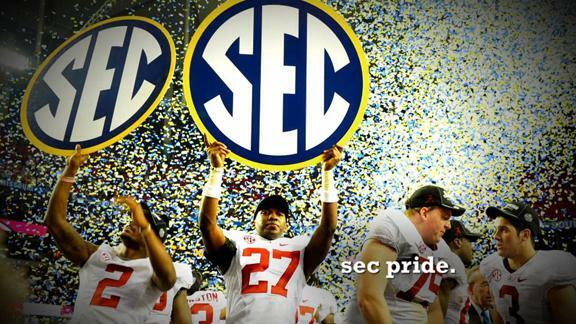 The SEC is the best, so and so is second best, and so on. But it's just conjecture that fans take as gospel. We were an Auburn win away from all 5 BCS games being won by the underdog. The college football championship system isn't a best of 7 series playoff system where the better team usually wins. Anything can happen in a 1 game system. Is the Pac 12 better than the ACC? Is the Big 12 better than the B1G Ten? The fact is that since it's never really settled on the field, who the hell really knows? The BCS showed it this year. The stats out there (bowl records, non-conference records, etc.) can point us in the right direction, but we just don't know. Feigning certainty is more of a shtick to attract attention than actual confidence. It's the presented certainty of it all that gets under my skin. I recently attended a happy hour with some old coworkers up in San Francisco where I saw a friend who went to Cal. He asked me what I thought about the Rose Bowl and I told him I thought it was going to be a really good game, basically a coin flip and that I might give the edge to Michigan State purely based on Mark Dantonio. His reaction was priceless. I got an indignant lecture about how the B1G Ten is awful, the Pac 12 is amazing, and I'm a huge homer. This is what it has come to. Here i am getting shamed of my college football opinions and allegiances regardless that my 13-1 school beat his 1-12 school by a good margin. All it took was the mere suggestion that Michigan State could beat Stanford. Michigan State's win didn't prove me right or wrong as I'd agree that in 2013 the Pac 12 is better and probably by a pretty good margin. The problem is that we turn to these conference prestige rankings as a sense of pride or embarrassment and believe in their total legitimacy. Nobody, fans and media included, seem to actually get out a magnifying glass to study the matchups and the talent. It's just a blind equation of conference x > conference y > conference z > conference w > Sun Belt. It's like saying every single Sony TV is better than a Samsung which are all better than Vizios. While this may be a helpful guide, you got to look at the specs, the components, the year of the models, etc. Rewinding the clock back to August when FS1 launched, I tuned into their debut night to check out their college football studio coverage, something that others have been critical of throughout the year. When it came to predicting a national champion, predictions went according to party lines. Eddie George picked Ohio State. Clay Travis stayed in the SEC and went with Bama while the guys with Pac 12 ties (Joel Klatt and Petros Papadakis) opted for Stanford. This is another byproduct of the toxic college football media eco-system as pundits feel the pressure to appease their local constituents. Kirk Herbstreit moved himself and his family away from Columbus largely because of this pressure. Sure, Stanford, Bama, and Ohio State were good picks but it's just another example that the media isn't constructively doing their job. Too many folks in the media are making picks, comments, and predictions with guiding principles that include overstating their confidence, using conference membership more than team makeup, and praising and shaming specific teams and fanbases. While the networks love the short term pop in page views and ratings from having an in-house conference propagandist, they're oblivious to the fallout. For years I've known that outside of live games some Ohio State fans have been boycotting ESPN. I always thought this was a fringe minority of the fanbase, but on a recent trip to Ohio I was totally flabbergasted how many times this position was echoed by a lot of people that didn't fit the overly sensitive, tin foil hat wearing, grudge holding folks I believed to be in this bucket. Some of them despite being huge sports fan hadn't watched a single 30 for 30 nor SportsCenter or GameDay. They attributed a lot of it to Mark May and some to what they deemed over zealous reporting of the Tattoo scandal. A lot of these fans counted down the days to FS1's launch only to see more of the same with one television personality (Travis) seemingly brought in for the sole purpose to ruffle feathers. How many other college fanbases had a sizable amount of fans who felt this way? Polling some fans on message boards and social media showed a whole hell of a lot of fans had taken the same stance at other schools. Either investigative reporting that missed its mark or a commentator or two that just seemed to get a little too much joy trolling their fanbase had led to a firm stance they wouldn't support original programming of a particular network. While competing networks and digital platforms have eaten into SportsCenter and other studio show ratings, how big of a chunk of it can be attributed to fans who feel spurned or disrespected? Where else does this happen? I can understand NHL fans boycotting ESPN but do NBA fans or NFL fans ever just feel they're targeted? It doesn't happen because there is no incentive to do so at the pro level as the leagues can assert some level of influence with networks. There are no loud mouthed television personalities continuously singing the praises of how fierce the NFC West is or how playing in the AFC South is a cake walk. But ESPN and others continue to capitalize on regional fandom and the growing toxic nature of college football fandom specifically. See the now infamous S-E-C chant. Where it started and who exactly does it is still a mystery. 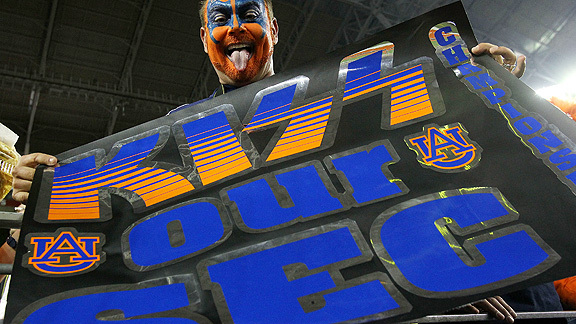 Many SEC fans have told me they hate it so I'm a bit in the dark in which fans prioritize their conference affiliation and how it became such a big part of their identity as a fan. – The realization that not only does ESPN use the chant in SEC Network promos but it also plays as background music during graphics introductions in live game telecasts, something I realized in the 2 minutes watching LSU vs. Tennessee in basketball. Yes…….two putrid SEC basketball teams with 4 losses each is worthy of the chant now. Whatever the intention of the chant is, the fact is that it's a major source of friction among fans and ESPN's embracing of it is only going to intensify that friction. Bama fans mocked by the chant at the Sugar Bowl are not going to stop, but only embrace it more. A-C-C chants are only going to further incite fans on both sides to mock each other using their chant of choice. It's only a matter of time until the other conferences find a way to thump their chest while mocking the SEC chest thumping. Unfortunately it's only getting started and ESPN's ownership of the soon to launch SEC network and early decision to embrace the chant is only going to intensify the bad blood between fans. Similar to rap publications fanning the flames of the east coast vs. west coast rap "war" in the late 90's, this is a similar attempt to elevate regional pride at the cost of deteriorating relationships and discourse. ESPN's interest in the SEC in addition to competitors' interests in other conferences and employment of certain controversial personalities ensures we're only at the beginning of this and it's terribly depressing to know where the sport is headed with no real playoff system to keep personalities honest. I don't want to get swept away in all of this noise but I already am to some degree. It's sad because I absolutely love the sport without the noise. I love the traditions, the stadiums, the rivalry games, the upsets, and the history. I love the games and the sport itself and not the power struggle of opinion that was once a lively sideshow. Now it is the main attraction. I don't need to whip out my conference affiliation when meeting a random fan who supports a random team. I don't need to prop up Michigan State's win in the Rose Bowl as proof of anything other than on that day Michigan State was better than Stanford. It doesn't mean Iowa is better than Oregon State or Illinois is better than Utah. I used to enjoy frequenting a local watering hole where a lot of various local alumni groups would watch games, but unfortunately that is a thing of the past. Fighting over what TV has what game, what conference is better, who has better academics, is more deserving of a scandal, or whose conference network makes the most money has completely taken the fun out of being social with the sport. You only have to look to NCAA basketball to show what a real playoff system can do as the discourse and fandom of that sport centers around the teams, players, and sport itself and not the ebbs and flows of conference prestige and pride.